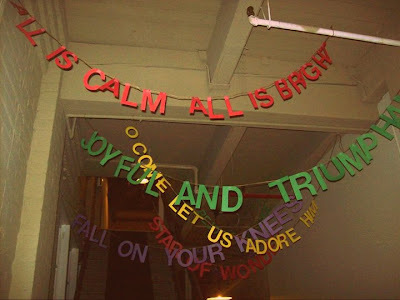 Our church is attempting to build a well during Advent this year. It's huge goal ($5000) for a small church, but I think we can do it! 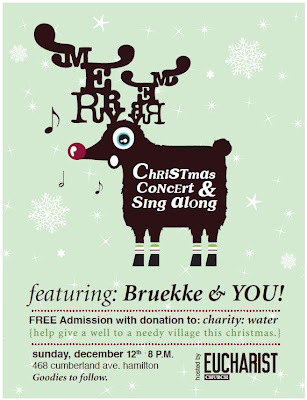 Last night we had a fundraiser - our 'Christmas Concert & Sing Along', featuring a concert by the amazing local band Bruekke. There was a great turnout, the music was unbelievable, and it was just great to sing Christmas carols together after the concert. You can see a few pictures here. These cute Christmas words were inspired by this post. Don't they look cute? Christmas songs just have the best lyrics...Anyways, the night was a total success, and we raised $3000! Here's a little video from the concert. You can find out more about Bruekke here.